It’s always exciting when a new addition to the local dining scene offers something a bit different from everything else around. Well, there’s a recent restaurant opening in Tega Cay that offers a cuisine that is new to the area with food that is fast, fresh and delicious. 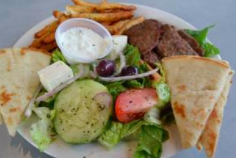 The Greek restaurant Greco Fresh Grille offers homemade food made from scratch, and it is already a big neighborhood hit. The menu features lamb, chicken and falafel platters served with Greek salad and house – cut fries that come in three flavors. The hummus on the menu also comes in three delicious flavors. On the menu, you will also find gyros with tzatziki sauce, as well as spinach pie, salads, kebabs, baklava and more, all showcasing the flavors of classic Mediterranean food. There are three other Greco Fresh Grille locations in Charlotte, and this is the first South Carolina location. Be sure to check out this new Mediterranean eatery and neighborhood gem that is great for lunch or dinner. For more info and details on the restaurant, read the article at Heraldonline.com.